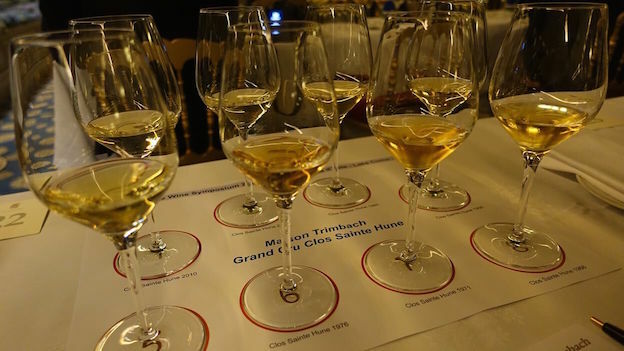 This remarkable vertical tasting of Trimbach’s flagship Riesling Clos Ste. 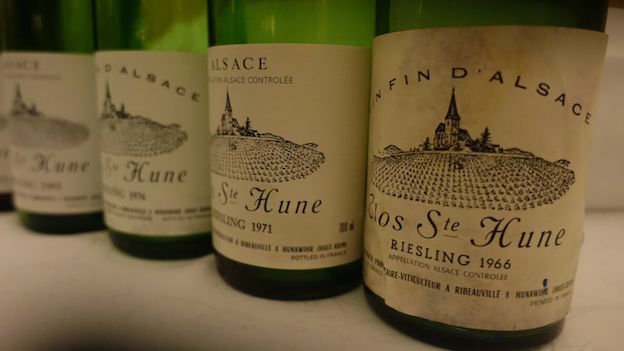 Hune encompassed a number of reference-point, older vintages that are now virtually impossible to find along with the soon-to-be-released 2010. Clos Ste. Hune has a rare ability to transmit the essence of place and vintage while acquiring considerable complexity in bottle, all of which make make it one of the most distinctive wines in the world. I tasted these wines at a seminar hosted by Pierre Trimbach last year at the Villa d’Este Wine Symposium. Clos Ste. Hune emerges from a 1.7-hectare parcel in the Rosacker Grand Cru in Hunawihr. Pierre Trimbach’s great grandfather and grandfather planted these vines many decades ago. The exact age of the oldest vines is not known, but the youngest plants here are about 35 years old. Over the last handful of years, the Trimbachs have transitioned Clos Ste. Hune to organic farming. The soils in this south to south-east facing site are rich in calcaire (limestone) that gives the Clos Ste. Hune its distinctive energy, drive and precision. Clos Ste. Hune is rendered entirely in steel, with no malolactic fermentation, and taken to dryness. Bottling is done early, but the wine spends several years in the cellar prior to being released. One of the things I admire most about Clos Ste. Hune is how it develops in bottle. The wines don’t really age, rather they transform gracefully over time. It’s hard to pick a favorite in front of so many benchmark vintages, but the 1990 is, in my view, the most complete of the wines today. It is both remarkably young, but also full of the nuances that blossom only over extended time in bottle. The 2010 is likely to need many years to peak, but my impression is that it will soon join the ranks of the greatest Clos Ste. Hunes. A thread of mineral-drenched intensity runs through all of these wines, which makes for fascinating and endless comparisons. Tasted ahead of its official release, the 2010 Riesling Clos Ste. Hune is wild, powerful and unrestrained, with a real sense of mineral and phenolic intensity. 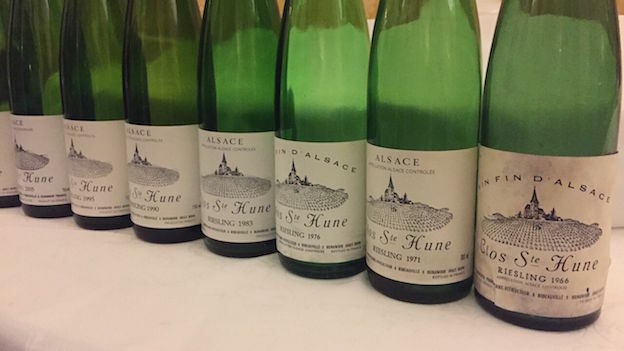 Smoke, slate, orchard fruit and white flowers are all incredibly vivid in a spherical, concentrated Riesling that will drink well for many decades to come. Today, the 2010 is painfully young and austere, but the potential is evident. It is fascinating to go back to the 2010 after tasting the older vintages, because it clearly has the textural sophistication and pedigree of the best of the older wines in this tasting. Quite simply, this is a magnificent, regal edition of Clos Ste. Hune. I won’t be at all surprised if the 2010 one day merits a three digit score. Pierre Trimbach describes 2010 as a year with small yields and high malic acidity. The 2010 is an epic wine in the making. The 2005 Riesling Clos Ste. Hune is in a beautiful spot right now. Open-knit at the outset, the 2005 possesses gorgeous mid-palate sweetness, with unctuous texture and enveloping contours throughout. This is an especially exotic, flamboyant Clos Ste. Hune that will thrill readers seeking immediate gratification. Tropical fruit, bananas, mint, pineapple and honey all meld together in an expressive, if young, Clos Ste. Hune that can be enjoyed today or cellared for up to two decades, perhaps more. At twenty years of age, the 1995 Riesling Clos Ste. Hune is utterly captivating. Secondary and tertiary notes are laced throughout, yet there is an incredible amount of freshness in the wine. Sage, lightly floral honey, almonds and dried pears caress the palate in a soft, yet wonderfully deep Clos Ste. Hune that is incredibly expressive today. 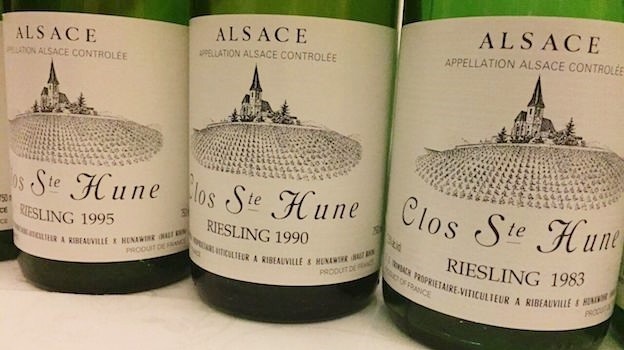 The 1995 will more than satisfy readers who want to drink a complete, close to mature Clos Ste. Hune without going back to the 1970s and 1960s. With time in the glass, the 1995 gets more and more crystalline and weightless. What a dazzling wine this is. The 1990 Riesling Clos Ste. Hune is a timeless jewel of a wine. There is not much else to say. Utterly magnificent in the glass, the 1990 is extraordinarily beautiful from the very first taste. The passage of time has added shades of nuance, but above all else, the 1990 stands out for its incredible freshness and energy. The tightly wound finish and overall vibrancy both suggest the 1990 will drink well for a period measured in decades, not years. Endless and ethereal, with striking inner perfume and sublime layers of unctuous fruit intermingled with beams of minerality, the 1990 simply has it all. The 1983 Riesling Clos Ste. Hune shows the wilder, more animal side of Riesling. Game, smoke, petrol, licorice, herbs and dried flowers all race out of the glass. Disjointed and burly almost to the point of being aggressive, the 1983 makes its case with pure power more than finesse. I don't see this imposing Riesling ever being especially refined, but it certainly does not lack personality. Golden in hue, Trimbach's 1976 Riesling Clos Ste. Hune is fully mature, with plenty of dried stone fruit, herb, licorice, crushed flower and hazelnut nuances. Based on its intensity and depth the 1976 will likely hold on for at least a few years, but it won't improve materially from here. This bottle, sadly, is a victim, of a less than perfect cork, but at the very least one can see that it has held up well. One of the highlights in this tasting, the 1971 Riesling Clos Ste. Hune is rich, vinous and beautifully textured in the glass. Hazelnut, honey, dried flowers, mint and orange peel flesh out in a generous, inviting wine loaded with class and personality. Although fully mature, the 1971 is likely to provide exceptional drinking for at least another decade, perhaps more. There is an element of classical austerity to the 1971 that stimulates the imagination as to what might develop with more time in bottle. I won't be surprised if the 1971 is even more compelling in a few years! This is an especially powerful, explosive wine. The 1971 doesn't have the depth and allure of the very best wines in this tasting, and yet it possesses remarkable energy and intensity. The 1966 Riesling Clos Ste. Hune is poured and a door opens into another dimension. A dimension where time appears to stand still. Complex, nuanced and breathtaking in its balance, the 1966 possesses stunning depth and complexity. At nearly fifty years of age, the 1966 is fully mature, but it is also eternal. The 1966 is undoubtedly beautiful, but it is also fully resolved. So the emotions are like those one feels reading the last chapter of a great book. Everything has been said, and yet I can only hope to taste the 1966 one day in the future.